State legislators reconvened for the start of a new session and things are off to a good start. Representative Sandra Scott took the first step toward getting LGBT Georgians comprehensive civil rights protections under the law by pre-filing HB 19. The aim of the bill is to ensure equal protection from discrimination for everyone, including LGBT people, when they seek housing, employment, and service in public places. But the threat from religious exemption bills isn’t gone yet. The Peach State has seen inclusive civil rights legislation before; in 2017 the Senate presented the first civil rights bill that specifically included LGBT protections. Despite widespread public support from across the state, this groundbreaking initiative was not passed. We are excited to see a new bid for equality so early in this session. Remain vigilant, though, because our adoption and foster care system could be on the line again. Advocates for religious exemptions want to exclude LGBT youth and families, but continue to accept public funding for adoptions. Currently, adoption agencies in Georgia who receive federal funding are prohibited from doing this, though that hasn’t prevented state legislators from attempting to pass discriminatory bills. In 2018 and 2017, anti-LGBT senators made a push for such legislation, but our representatives wisely ignored the measure and it did not pass. Now this year South Carolina has taken a different path towards this inequitable practice. Governor Henry McMaster wrote to Secretary of Health and Human Services Alex Azar asking for an exemption for adoption groups who claim serving LGBT people violates their religious beliefs. Other states, including our own, are watching and waiting for the response. In fact, there has already been talk from Senator Butch Miller about making another attempt at exclusion in Georgia. We cannot stress enough that everyone has the right to live their life as they see fit, including living by their own religious beliefs. But taxpayer-funded organizations should not be allowed to refuse service to members of the public because of who they are or who they love. You can’t keep potential adoptive parents who could provide a child with a better life from adopting simply because they are LGBT, nor can you discriminate against an LGBT child seeking a family. That’s simply wrong. What’s next for Georgia? Our love for football unites many of us and Atlanta will be the proud host of the Super Bowl in February. Georgia’s economy will surely flourish from the increase in tourism dollars, as it already does from having so many tv shows and movies filmed here. That comes to a halt if we become a state who doesn’t value all our residents. Other states that have taken steps to exclude the LGBT community, like North Carolina and Indiana, were hit hard by the economic backlash from the boycotts that followed. Major events were held elsewhere, tourism dropped, and businesses decided to open in states that chose inclusion. Georgia has too much going for it to let that happen. 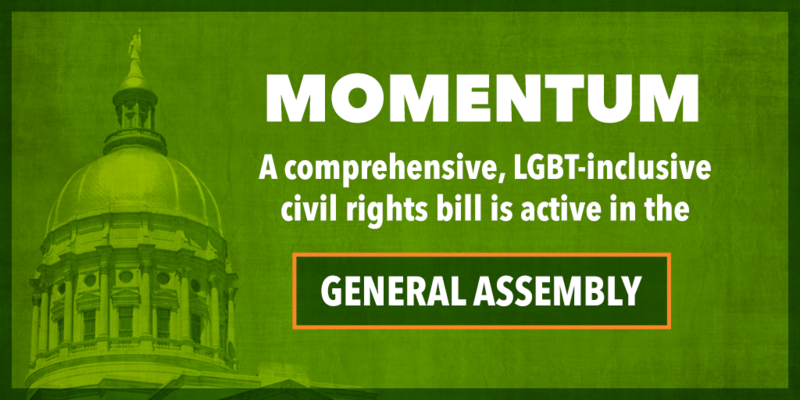 We will watch and work to make sure that our state is open for business and open to all.